The late summer period this year may seem a rather barren time for planetary observing. Almost all of the brighter Planets are poorly placed in the sky. Jupiter is already low in the west at sundown. Saturn is no better being located at far southern declination it will remain poorly placed for northern observers for the next several years. Mars is near solar conjunction and not observable. Only Venus is well placed near sunrise. There are however two planets that are available for observation. The distant Ice Giants Uranus and Neptune are both well placed in the early hours. Though faint and obscure compared to the brighter planets hunting them down can be both an educational and rewarding process. For more advanced observers using large telescopes it is possible to see details on these remote worlds. At magnitude 5.7 Uranus is theoretically visible to the naked eye though of course you’ll need good eyesight and a dark and transparent sky to spot it. Binoculars easily reveal it as a star like object. During 2017 the planet is located in Pisces very close to the 4th mag star Omicron Psc which will greatly aid in locating the planet. 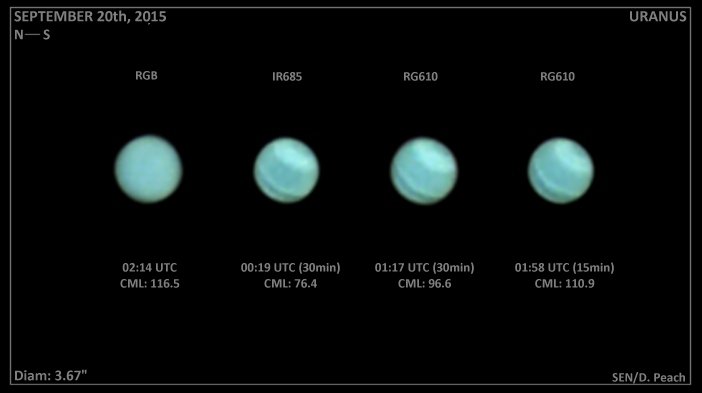 Uranus comes to opposition on Oct 19th when it will be visible throughout the night. Neptune is significantly more challenging to locate glowing dimly at magnitude 7.8. It is located among the stars of Aquarius and remains very close to the 4th mag star Lambda Aqr throughout 2017. You’ll need binoculars as a minimum to find it and will appear as nothing more than a dim looking star. It comes to opposition on Sep 5th. A good finder chart is essential if locating these planets by star hoping. Uranus is fairly straightforward but Neptune can be frustrating. Given both planets are now located in rather barren areas of the sky well away from the Milky way this will aid in quickly locating them. Due to their great distance Uranus and Neptune never appear more than tiny disks as seen from Earth. Uranus reaches 3.7 arc seconds in apparent size at its best while Neptune only attains the grand size of 2.4 arc seconds! This means that views using small telescopes are generally rather limited. However even a 75mm (3inch) telescope will show both planets are non-stellar in appearance (especially Uranus which will appear is a tiny disk.) With telescopes slightly larger in the 150mm (6inch) range both planets appear as clear disks with pale hints of colour though no detail will be visible on them. Connect a camera to a small telescope and expose the image for several seconds and you’ll quickly see that Uranus is surrounded by four faint points of light. These are its four largest moons – Ariel, Umbriel, Titania and Oberon. With Neptune its largest moon Triton will be easily visible alongside the planet. The motions of the moons will be easily visible on images taken over the course of a few hours. Sadly for us to see more on these distant worlds large aperture telescopes are required. With large aperture telescopes above 30cm (12”) we are now able to see these worlds with far greater clarity. Visual observers using telescopes in this size range will clearly see both planets as small sharp disks when the seeing conditions are good. Both show distinct pale blue/green colour tones. The brighter moons of both planets can also be seen provided the sky is transparent and the location dark. Unfortunately when it comes to seeing detail visually on these planets it is notoriously fraught with the problem of straining to see detail that you may expect to see (such as faint belts and zones). I’ve observed both planets under near perfect seeing many times both from home and abroad using my 36cm telescope, and more recently at Pic du Midi using the 105cm telescope and have never seen any detail on either of them. While it is without doubt in my view that details have been seen by experienced observers in the past on occasion do not be disapptioned if you see nothing other than a pale blue/green disk. Using A W#23 or 25 filter may help in revealing any possible banding or possible bright spots. The real fun with these planets comes when we apply modern imaging techniques with high speed planetary cameras and near IR filters to penetrate the thick hazy upper atmospheres of these planets. We then start to see clear belt and zone patterns, as well as bright spots in their atmospheres. Cameras such as the ASI224 and ASI290 cameras with their high sensitivity in the IR part of the spectrum have revolutionised amateur study of these worlds as it is in the IR part of the spectrum that we see all of the activity. Neptune is an especially active world and warrants far greater attention than it gets. Large bright spots are frequently occurring there and many have been discovered by amateurs. In fact during my recent short stay at Pic du Midi, despite imaging Neptune on only two nights, on both nights bright spots were recorded that could have easily been seen with large amateur telescopes in good seeing. Even more recently within the past few days (end of July) further bright spots were discovered by the Keck Observatory there are easily bright and large enough to be observed in amateur images. Though Uranus and Neptune lack the brightness and apparent size of the brighter planets they are none the less fascinating objects in their own right. With small telescopes the views are rather limited, though it can be enjoyable simply hunting down and seeing these remote worlds with your own eyes. With larger aperture telescopes and high speed planetary video cameras both planets can present fascinating activity (especially Neptune.) Both planets are well placed throughout the late summer into winter so now is a great time to try your hand at observing the most distant planets in the solar system. Damian Peach is an amateur astronomer who is renown for his astrophotography and outreach activities. Damian is a long-standing member of the BAA and is assistant director of the BAA Jupiter Section. A short historical account and guide to regular observations of Uranus by Paul G. Abel and Damian Peach can be found in the tutorial section of the website. Click here to find out more about the BAA's Saturn, Uranus and Neptune Section. To view members' observations of The Ice Giants search the member pages.